Bruce Dickinson continues to enjoy a rich and varied experience in the music industry. 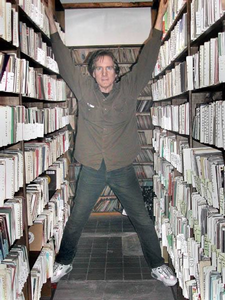 After stints as Music Director of his college radio station, NPR radio engineer, promoter, music journalist, and rock and pop buyer for the Harvard Coop record store in Cambridge, Massachusetts, he joined CBS Records in their Boston branch. As Marketing and Artist Development Director for Columbia Records in New York, Dickinson oversaw the marketing and promotion strategies for a wide range of recording artists, including Billy Joel, Psychedelic Furs, Paul McCartney, Miles Davis, and Bob Dylan. It was for Bob Dylan that he created BIOGRAPH, the first of its kind box set retrospective. The set was devised as a labor of love in order to revive Dylan’s catalog and career, which was at a low ebb at the time. It not only succeeded; it became the template for the box set industry that followed and continues to this day. While at Columbia, Dickinson was also the in house point person for Howie Klein’s 415 Records (Romeo Void, Translator). At the same time, Dickinson was also instrumental in securing U.S. releases for two then-unknown Australian bands, Men At Work and Midnight Oil. It was also Dickinson who was responsible for creating the marketing plans that launched Julio Iglesias into the American consciousness. In 1984, Dickinson was hired away by Chrysalis Records as Senior Director of A & R. There, he worked with such artists as Billy Idol, Paul Carrack, Icehouse, The Colourfield and The Divinyls before moving on to a National Director of A & R position at EMI, also serving as liaison with Capitol of Canada. While at EMI, he worked on projects by Bobby McFerrin and The Red Hot Chili Peppers among others. In late 1988, Bruce moved to MCA Records where he was Vice President of A & R. There, he discovered and signed The Tragically Hip to a worldwide deal. They soon became Canada’s number one rock band, achieving long time phenomenal success there. While at MCA, Dickinson also signed Steelheart, another multi-platinum success, and plotted Meat Loaf’s hugely successful (15,000,000 sales) comeback, helping put together a deal for and doing A & R for Meat Loaf’s “Bat Out Of Hell II”. Since late 1995, Dickinson has worked as a successful independent producer, musicologist, and marketing consultant. Among his clients are Sony Legacy, for whom he has created products and strategies for artists as diverse as Cheap Trick, Leonard Cohen, Bob Dylan, Iggy Pop, The Clash, Johnny Paycheck, Judas Priest, Ozzy Osborne, and Billy Joel.